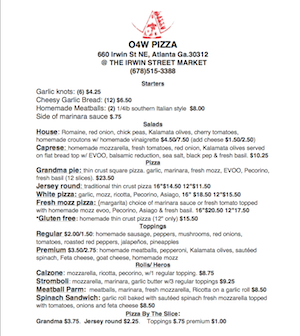 Old 4th Ward Pizza will open for dinner tomorrow in Irwin Street Market. The Italian-American, New Jersey-style spot will serve thin-crust pies and slices cooked in a brick oven, in addition to salads, meatball Parmesan, calzones, and stromboli. Lunch service will begin next Tuesday. Expect pizzas like Grandma’s Pie, a square pizza cooked in a cast-iron pan with house-made mozzarella and marinara sauce. 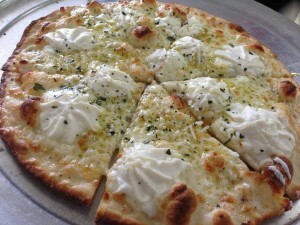 Specialty pies, such as duck prosciutto and cashew cheese margarita will rotate weekly. Gluten-free pizza will also be available. Old 4th Ward Pizza replaces Jake’s Ice Cream, which recently took over the Irwin Street Market space formerly home to Bell Street Burritos.